For our power testing, we run Prime95 for at least 60 seconds then use software to poll the integrated power counters on the chip to get results. Depending on the CPU, we can get data for the full chip, per core, DRAM, uncore or integrated graphics – it relies on our tool being up to date or the registers for this data to be known. Normally this way of reading the power consumption can be a smidge inaccurate compared to more invasive methods, it is quick and scriptable, and it is this data that governs if and when a CPU is hitting power limits and needs to adjust fan speeds/frequencies to compensate. To start, let us take the full package power consumption for Threadripper. On the whole, Threadripper is a hungry chip even at idle. Most of the power here is being consumed by the memory controller and PCIe bus to keep the GPU ticking over with a static display. The fact that the 1950X running DDR4-3200 memory is pulling another 13W+ from the CPU shows how much of an impact the memory controller has on total power consumption. For all the chips, we’re recording sub 2W power draw from the cores. When we load up the package with a single thread, it fires up the uncore/mesh as well as the memory and puts the system into its peak turbo state. Depending on the way the CPU is designed, this could fire up a single core or a bank of cores, so although in a bank of cores only one will be doing the work, it can still train power to be noticeable. 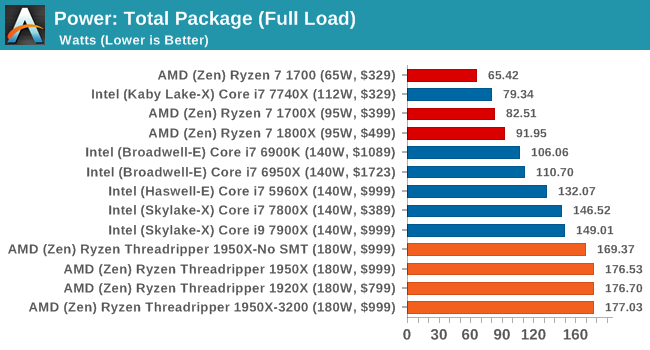 The results show all the Threadripper CPUs again hitting around the same mark, well above the Ryzen CPUs, and matching the 10C/8C parts from Broadwell-E and Haswell-E respectively. The 1950X running DDR4-3200 is still pulling an additional +13W, but interestingly the Skylake-X cores have jumped in power consumption to around this level. 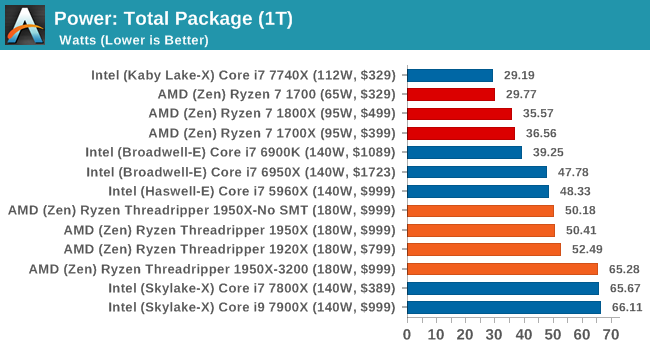 It would appear that the MoDe-X interconnect used in Skylake-X can also draw substantial power. The next test is running the CPU will a full complement of threads for the design of the chip. This usually puts maximum strain on all the cores, the interconnect and the memory controller. 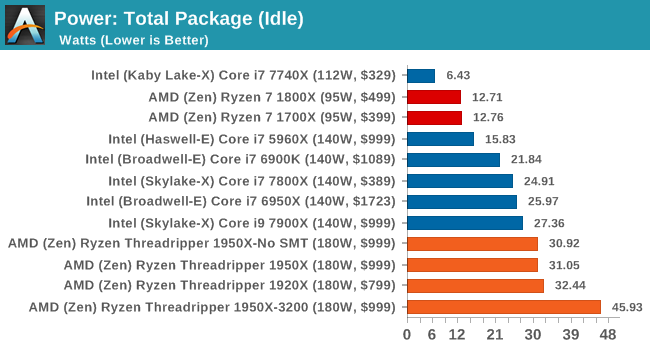 All the Threadripper CPUs hit around 177W, just under the 180W TDP, while the Skylake-X CPUs move to their 140W TDP. The 1950X in Game Mode seems to draw a little less power, which might be due to how the DRAM is being run in a NUMA environment. 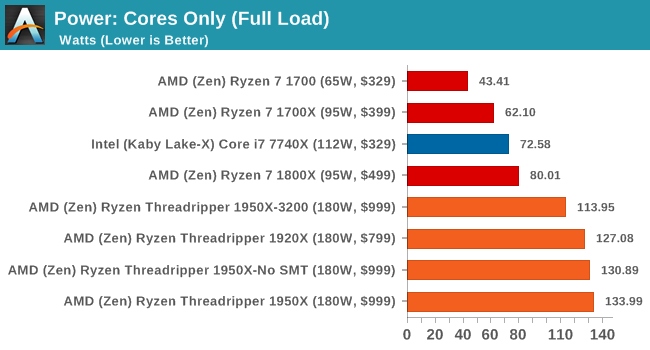 The key element to this graph is the 1950X running at DDR4-3200. Because the faster DRAM requires the memory controller to draw more power, it leaves less power for the CPU cores, potentially resulting in a lower turbo core frequency. So while the faster memory might guarantee faster performance in memory limited scenarios, the core frequency might end up lower given worse performance overall. It’s an interesting thought, so we plotted the per-core power for the 1950X at DDR4-2400 and DDR4-3200. In this graph, the core number on the vertical axis is where the power measurement is taken, while from left to right is where we are loading up the cores, two threads at a time. Initially we see that with two threads being loaded onto one core, that single core is drawing 20.77W. This quickly moves down to 19W, 17W, 16W to 11W by the time that half of the chip is loaded. At this point, with 8 cores loaded, the cores on their own are drawing 89W – if we add in the DRAM controllers, this would certainly be more than a Ryzen CPU. However, as we move past 10 cores loaded, something odd happens – the total power consumption of the cores drops from 120W to 116W to 102W when 24 threads are in play. This is indicated by the second silicon die drawing less power per core. It then ramps up again, with the full chip giving each core about 8.2W. At first, the single core gets a big 21W, although as we load up the cores by the time it hits 4 cores/8 threads, the sub-15W per core at DDR4-3200 is being eclipsed by the 16W per core at DDR4-2400. Moving through we see a small wobble at 24-26 threads again, with the final tally putting only 114W onto the cores, 20W less than at DDR4-2400. Some of the data for Game Mode did not come through properly, so we can’t draw many conclusions from what we have, although an interesting point should be made. In Game Mode, when a system requires a low number of threads, say anywhere from 2-8, because SMT is disabled these threads need to run on different CCXes. In Creator Mode, these threads would group into 1-4 cores over one CCX, and consume less power. At DDR4-2400, this means 65W in Creator mode for 8 threads (4 cores) compared to 89W in Game mode for 8 cores active.